Hello again friends! Hope your weekend was wonderful! Hopefully, you were not snowed-in on Saturday due to the heavy snow storm that some experienced. And if you were, hopefully, you took some time off from the busyness of the outside and were able to relax get some home projects done:) I was not snowed in but my driveway had some ice that kept me from going to the store. My husband eventually cleared it off but by then, I decided it was best to just hang out at home. It probably was a good thing, because I am sure I would have spent more money than I needed to. Speaking of money, we are all looking to save a little money right? What family doesn’t? I know we are! But sometimes knowing how to start could be puzzling for some. So today we are taking about ways to save money on family needs. In the past, I have included low cost ideas on some of my home decorating items but I would like to discuss more family-friendly budget ideas on here. While I may not solely write about budgeting, this blog is home and family related and I think budget friendly ideas are always great to discuss. This post will definitely help me get started! There are so many ways to save money on family needs but I am only zeroing on a few general ideas. Many of them (actually all of them) we have tried within our own family and have seen so much improvement. It will be great to keep a tally on how much of a difference each one helps us save per month but I have not gotten down to the dollar for dollar amount yet. What I do know, is that I am spending way less on household products (for example) by making most of my own. This is not a get rich scheme, but every little extra helps. We have been able to use the little extra in other needed areas of our lives and at times, help meet smaller needs of other people. If you are looking to save a penny here and there, hopefully, this list will give you some direction. Don’t let it overwhelm you. Commit to one or two until you feel you have mastered them, then move on. And really, once you get into the habit of doing them they will come naturally to you and become a part of your life. 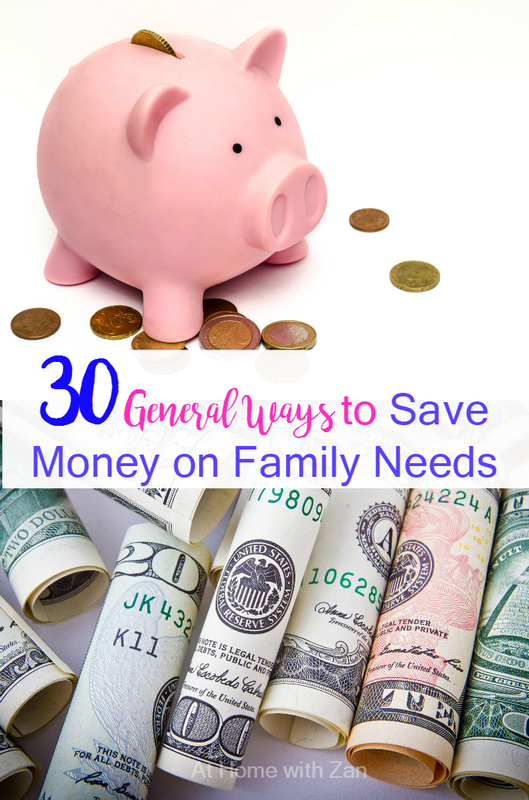 So here are 30 Ways to save money on family needs. They are not written in any particular order – just randomly as I thought of them. Create a working family budget and TRY to stick to it: Notice I wrote the word “try” in caps. Because sometimes sticking to a budget is not the easiest thing to do. But the more you stick to it the more you will see where your money is going. Bills are being paid and allotted money is used or allotted reasons. Re-purposing and Reusing: No, don’t keep your place junky with all kinds of old stuff but there are so many different items that could be re-purposed into something new (if you can) or re-used for something else. As an example, an old dresser could be repainted and used as a console table or an empty food jar, to store food in the fridge. Even ziplock bags could be washed out (depending on what was in them) and reused again. I usually throw out the ones I store meat in but if it is dry food like cereal or so, then they could be reused. Using homemade household cleaners: Not everyone likes making their own cleaners but if you do, it will save you tons of money. Using homemade remedies for minor illnesses: There are some great home remedies out there that are good for minor illnesses. Honey mixed with lemon juice is always a great way to sooth a sore throat rather than quickly purchasing cough drops. Kids clothing swap: If you are comfortable, a great way to save money on little kids clothing is to swap with a friend or relative who has a kid that has outgrown some of his or her clothing. And vice versa, considering that they do not have other siblings who need it. Clothing can always be returned later. Cooking and eating at home: The more meals you cook at home, the less money you will spend eating out. Buying food staples in bulk: There are many food staples that could be purchased in bulk for a reasonable price. A 25 pound bag of flour may last about 3 months but 25 pounds of flour bought in 2 pound bags at a time may only result in 2 months of use. Hope that makes sense. Turning off light switches when lights are not in use: My husband used to remind me to turn of the lights when we are not using them. I don’t always remember to turn them off but I have come a long way. Purchasing household items in bulk such as toilet paper: I find that when we purchase toilet paper in bulk it lasts us longer than if we purchased the same amount but in increments. A 36 pack of toilet paper costs for $25 lasts our family of 5 (with two toddlers included) about 3 months. Homemade laundry detergent: Again, not everyone is a fan of making their own laundry soap. But this is another great way to save tons of dollars. Homemade dry mixes: I love having dry mixes on hand for making food such as pancakes and waffles. Making dry mixes at home is a great alternative to store bought mixes. Using cleaning rags: I have been purchasing less paper towels and using more cleaning rags instead. A good wash, dry, and they are ready to use again. DIY decor: If you are cut-out for this one, then you can save money by making some of your own decorations. DIY skin care products: Some skin care products does not have to be pricey. In fact, products such as face masks or dry skin care could be made using items from the pantry (think coconut oil, avocado, or dry powdered milk). Take inventory of home items before going shopping: I usually shop my pantry before going to make huge grocery purchases. Menu planning: This one saves us from buying random grocery items in hopes that we could put a meal together with them. Laundering and ironing your own clothes: Cleaners are not cheap. In the past, my husband took his work clothing to them because I was busy with little babies and could not seem to find time to iron his clothes. I am still busy, but we have tried to cut this out and go there only if he absolutely needs something ‘special‘ done to a piece of clothing. Decluttering and organizing: This is a big one! It is amazing how much stuff we may not know we even have because they are somewhere where we cannot find them. Keeping a clutter-free and organized home as much as possible will allow us to know where things are and keep us from buying duplicates that we don’t kneed. Fixing leaky pipes immediately: The longer we let leaky pipes go unfixed, the more water is wasted. It may seem like a small thing for a day or two, but it will add up after a while. Use natural air during the hotter months as much as possible (AKA as in opening windows rather than popping on the AC everytime): I know, the comforts of the AC is nice but so is natural cooling. If your home has tons of windows, you can save money by opening up some and allowing some fresh air into your home. Growing a garden: Nothing tastes better than food you have grown YOUR self! Think about how much beans, peas, corn, tomatoes, peppers, etc. you can get from a few seeds you have planted. Tasty homemade food, fresh from your garden. Freezer Cooking: I do not always do this but making meals in bulk and freezing some is a great way to save money on meals. Using Green bags: Green bags? Places like Walgreen’s and Walmart and other maybe stores, too, have those green bags that will keep fruits and veges longer in the fridge. The key is to make sure the food is dry before placing them in the bags so they would not get soggy. In-home date nights: Date nights does not always have to be done outside of the home. A simple dinner and movie at home is a great way to spend sometime with your spouse. DIY gifts: While I love receiving store-bought gifts, I also love receiving hand-made gifts. They are a great way to show someone that you really care. After all, you spent time making something from them rather than purchasing it already made. Plus you can definitely save some money by using items you already have on hand or making things in big batches (think cookies)! Drinking more water rather than juice: Not only will it be better for you but it will save you tons of money, too. Imagine if you have a large family and you drink juice with every meal. That is a lot of juice to go around. Water may not be the most desirable but it will help save so much money. In our home, we sometimes drink juice after breakfast (depending on the type of breakfast). I admit, there are mornings when I feel like a having a hearty glass of really cold orange juice. But we pretty much drink water with the rest of our meals. Every once in a while, we may do juice with dinner. Swapping babysitting with a relative or friend: It’s nice to have friends who are willing to watch your kids so you can get stuff done. You can return the favor to them when they need it, too. Investing in a good printer: If you print regularly, printing at home will save way more money than going to Fedex or some other printing place to print them. Bundling services: In this day and age of internet, everyone desires to have it. In our family, not only do I need it for blogging but my husband is in school online, and of course, he cannot do online school without the internet. One of the reasons we have not gotten rid of our cable, is because it costs us cheaper to bundle cable and internet than just having internet by itself. Those companies are smart. If you get just the one, they charge you a higher fee just to have it. Not everyone may agree with me on this one, but for us, bundling is better than keeping just the internet and then purchasing Netflix (which is cheaper than cable in itself). Save the random pennies: This may sound like a no-brainer, but save those pennies. When you get home from a shopping trip, remove those change from your pocket or purse and drop them into a savings jar or so. There are times, I like to keep just a few pennies, dimes, or quarters in my purse for another store use. You know those times when your items add up to $20.01 and you hate to break another $10 just to get a penny? Having a few loose change in my purse do come in handy for those times. But my general rule is to remove most of the extra change and dump them in a jar. They really add up to a few dollars over time. Don’t let them wash away in some laundry or mysteriously disappear in think air. So these are some ways we have been or have been trying to save money on our family’s needs. Like I mentioned earlier, there are so many others ways to save. I can think of a bunch more as I write. I may look into elaborating on some of the ones mentioned and may even update this list sometime. But for now, I am kind of sleepy and I think my mind is going blank. You can always subscribe to receive more budget-friendly posts and many other posts via your inbox. These are all great ways to save money, Zan! My husband and I save all of our change for vacations. It’s so nice not to have to draw one penny out of our checking accounts for food, etc. when we are on vacation. Those pennies do add up! That is such a great idea. How nice that you can use those pennies to buy food and such when you are on vacation. I love this idea. These are all wonderful ideas Zan. We implement the majority of these in our home. We need to work on the Menu planning by writing them down. I typically keep it all in my head from years of experience but I think I could do a little better by making a Menu list. I’m going to share this post on my FB wall today. Thank you for sharing Shirley! I find that without a plan, I am all over the place and tend to spend money on items that I really don’t need. Great Ideas here! I need to start putting together freezer meals and I would love my own garden. Thanks for linking up to Merry Monday! Sharing on G+! Have a great week! Ha ha, sounds like fun, especially the planting a garden. Happy to link up with you! These are great ideas! We do several, like investing in a good printer and shopping bulk. I’m always up for new ideas, though! Thank you! I am always happy to share new ideas Kristen. These really do help us!! Great money saving ideas, Zan. I do something similar with my change–I save all my quarters (they add up quickly). I will even go as far as giving cash at the store so my change will include quarters. I also save all of the freebie gift cards I earn for purchasing certain items at Target. These things go toward Christmas or other unexpected expenses. We re-use our Ziplock bags too…they go to Luke’s classic car and hot rod shop. 🙂 Thanks for these ideas. I love receiving the Free gift cards from grocery purchases from Target, too. I too, like saving them until I really need to use them!!! Wonderful ideas! We use many of these already but there are several I need to be more consistent with. Thanks for sharing. I am happy to share. Hopefully, you found a new idea to try out!